UJV 310, also known as Les Dunes, is a 16,000 sq. ft villa located on a hill in Saline, featuring over 2.5 acres of totally unspoiled land. It overlooks the turquoise ocean towards the south, and steep tropical green and orange hills to the east. Situated within easy walking distance of the seductive white sands of Saline Beach, villa UJV 310 offers St. Barth’s most pristine access to the ocean. 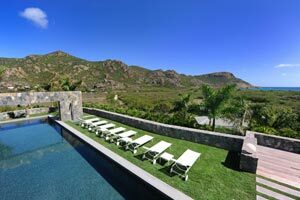 UJV 310’s main house features three floors including large bedrooms and living rooms, two kitchens, spacious wooden decks, two heated pools (80' & 40'), graded terraces delineated with elegant gray stone walls, an office and gym, and the largest tropical garden on St Barts. Each bedroom has its own private bathroom. In addition, the property includes two guest villas 300' down the hill. Exclusive services and easy access to the most attractive beach of the island are also hallmarks of villa UJV 310. The villa is sumptuous and epitomizes exquisitely refined luxury, with stylish contemporary furniture matching the island’s tropical location, long dining tables, wide and deep sofas, and the most modern amenities. The villa’s main floor features a master bedroom, large living room and 2 fully-equipped kitchens; one air-conditioned and the other opening onto the dining area with a high bar. The two swimming pools are set within the outdoors deck: one lap pool (80' long) for the exercise-oriented, and one "family" pool (40' long) with graded access. Villa UJV 310’s top floor offers a master bedroom and two adjacent bedrooms, each with bathroom and views towards the ocean, the pools and terraces. Two guest bedrooms are located on each side of that master bedroom; one has a private access to an oceanview deck, and the other offers a grand view on Saline pond and the hills beyond. Down a short, curved stone staircase from the main building, two guest villas offer separate accommodations for guests or private staff. The first guesthouse features a large outside living room as well as the fully-equipped kitchen and a large bedroom with adjacent bathroom. The second guesthouse offers covered terrace open on the tropical garden plus bedroom and bathroom. Villa UJV 310's tropical garden covers 2 acres and features bougainvillea, coconut trees and countless smaller trees and flower-bearing shrubs native to St Barts. A short 3-minute walk leads to the Saline parking area, with the renowned sandy beach just beyond. Butler - (optional, approx. € 50/hour) for items like grocery shopping, getting drinks etc.